Trimming cannabis buds gives them a smoother, more aesthetically pleasing appearance. It also results in a better consumer experience. 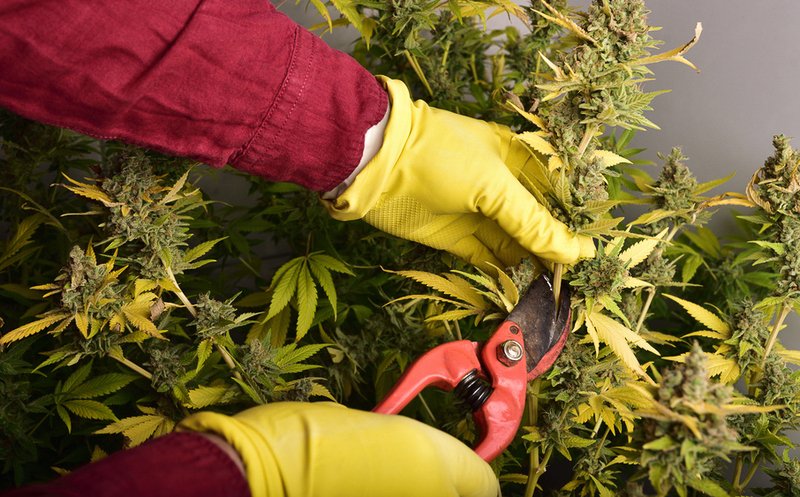 Trimming cannabis is done by removing the unsightly leaves and stems which can hold excess chlorophyll. This excess cholorphyll may lead to a harsher taste during use. There are two options when it comes to trimming: Hand trimmed and Machine trimmed. Hand trimming is the traditional way growers have groomed plants for generations. Hand trimming allows a skilled worker to craft the bud into a custom size. Doing so showcases the particular species and the unique properties that go along with it. It also ensures minimal loss in valuable bud material. Plus, trimming is a task that does not require much training or a skilled labor force. The downside is that it is time intensive, because each bud is carefully selected and trimmed at the trimmer’s individual pace. Each bud is unique and may require special/selective treatment to assure it is maintained to its highest potential. This is commonly done with more fragile or higher quality buds to insure a maximum yield for distribution. I recommend using pruning shears with a more narrow and pointed cutting blade. Trim away the bud’s longer protruding leaves as close to the mass of the bud as possible. You will also want to remove any protruding stems or “sugar” leaves. This will give the bud a clean, aesthetically pleasing look which will provide the consumer with a smoother experience. Latex gloves can be used to speed up the cleaning up process and save hands from retaining resin. A tray is recommended for under the trimming area to catch any timmed debris. Though the initial costs are less than machine trimming, time & labor costs can add up. Machine Trimming is quick and effective, especially if you have a large inventory. Certain models allow for 20 lbs or more to be trimmed in a single session. There are a wide variety of machine trimmers on the market and each have specifics that can fit any budget or desires. Models include everything from automatic electric to manual hand-crank. These are available in different formats based on the prefered trimming style, amount of product, final quality, and speed. Some are essentially electric versions of simple hand shears. These allow for increased speed, without compromising the “attention to detail” of hand trimming (example). Others are fully automated, self cleaning, self storing, and lightening fast. Some have the potential to process up to 6-8 lbs per hour (example). Some of the higher priced models can event trim closer to 20 pounds per hour! Traditionally, machines are used to process a large amount of lower quality product. This is due to their reputation of mangaling buds, cutting too harshly, and over processing the end product. That might be changing though. Over the past few years, engineers have been able to openly research and develop machines that are more efficient. These new machines are much closer to the quality of hand trimming than you might think. This allows the buds to remain in their natural form while speeding up the trimming process exponentially. So What is the Best Way to Trim Cannabis and Hemp Flower? 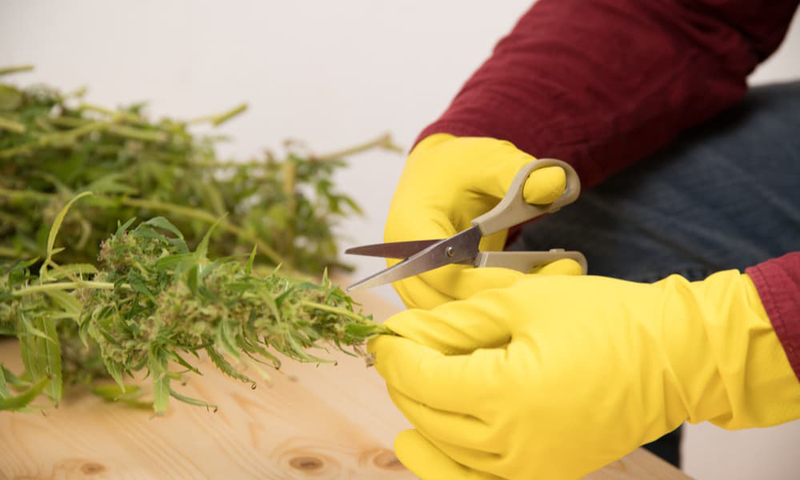 Depending on the size of your crop, and the quality of your buds, the trimming decisions you make do not have to be all or nothing. The majority of modern mechanical trimmers are sufficient for processing the majority of crops. Some growers still exclusively trim by hand, due to a more connected relationship with the plants and their clientele. Most farmers also use machines for the bulk of the harvest while still maintaining hand trimming practices for their top tier plants. Like in most things balance is key. Harvesting cannabis is no different. Trimming decisions should be based on your unique & individual harvesting needs.